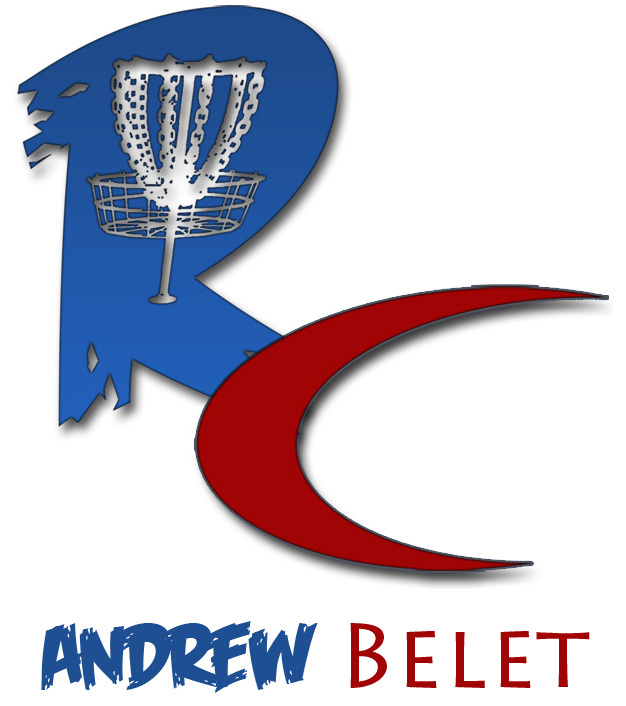 Editor’s note: This is the second of a two-part column on Andrew’s experience participating in and organizing tournaments under the Korean Professional Disc Golf Association. Get caught up on part one here. The man almost solely responsible for the rise of disc golf in South Korea is the great Sung Bae Kim. He has done more to get disc golf recognized in his homeland than anyone I’ve ever known. Kim and his dedicated crew have really worked on what I think is something the disc golf community needs to emphasize: youth activities. Whatever disputes players have with the way KPDGA runs tournaments, no one can say anything negative about their handling of expanding the Korean youth’s knowledge-base and skill set when it comes to disc golf. Kim is also no slouch when it comes to competition. He often participates in the tournaments he holds, and frequently wins in the masters or grandmasters divisions. Known for his international travel, he has also competed in Japan, Taiwan, Israel and tries to make PDGA Worlds every year. At the 2013 Worlds, he placed 15th overall in senior grandmasters, shooting a 56 in his final round. It’s been quite a busy time here lately. I’ve touched on it before, but I reason that I should go into a bit more detail with this next bit — one of the hardest parts of serving in the military is being gone all the time. I don’t mean just being deployed and away from your home and family, I mean being gone even while you’re deployed. 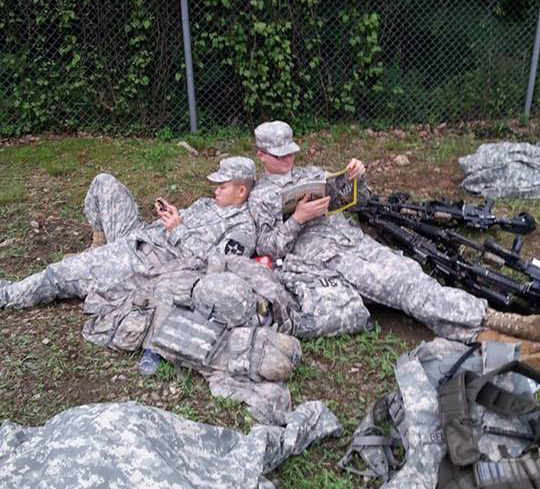 For instance, my unit just got back from more than a month in the field. Granted, “the field” in Korea is a bit more luxurious than “the field” in the states (i.e. hot showers, chow hall, even laundromats), but the fact remains you are out in the boondocks for more than a month. You are practically devoid of communication with the outside world, and do nothing but training, training, training. It’s a gigantic inconvenience, but one we have become accustomed to accepting. The KDPGA (Korean PDGA) hosted its biggest event — the Korean National Disc Golf Championships — in late September. To say I was excited would be an understatement. (Editor’s note: Andrew submitted many stories to be run over time. This one was written before the championships took place). While my rating is still well below 900, I figure it’s about time to give it a run at Intermediate. Hopefully, I can win it all and become an intermediate national champion! There’s one for the resume! I had heard, in year’s past, Korean nationals filled up quick. Not wanting to miss out on this once-in-a-lifetime opportunity, I e-mailed the secretary of the KPDGA, who speaks excellent English. I even let him know I’d be out in the field when the registration opened and he assured me he would e-mail me the signup form and hold a spot for me. So, everything was gravy. Or so I thought. At the risk of sounding crude and violent, I must begin today’s submission with my explanation of how I’ve treated international situations up until now. When I was 15, I was fortunate enough to go to Germany as an exchange student, which I loved. I joined the military right out of high school, and since then, my diplomatic skills have started at the barrel of my rifle and ended with the impact of the projectile. It’s not a fun job, believe me. Truly, South Korea would be much worse off if not for us. As well, America would be much worse off without our friends in the now-prosperous country of South Korea. For armed forces members here on the peninsula, we are constantly encouraged to go out in town and volunteer in the community. We do so, and gladly. In fact, this winter, I will be coaching the Korean Special Olympics, which is a passion of mine I’ve had since I first coached weightlifting in high school for the Montana Special Olympics. Most Koreans regard our presence here with great respect and a spirit of friendship. Older Koreans, who can remember the Korean War, show their gratitude to every American they see, armed forces or not. So I was quite excited when my Korean friend, HyunDo Jang, contacted me via Facebook and asked if he and his girlfriend, Shinah Kim, could come up and play the Dragon’s Lair. It was through these channels that I met up with a crew to play Beacon Hill, which led to my first ace in a foreign country. I made even more friends through it, too. I was lucky enough to have three of those friends make a long journey up to play my new course, the Dragons Lair, which now has tone poles. Jessica and Connor took a bus from another military base down near Seoul, and James came all the up from Daegu via car. That’s about a six hour-drive, and only if the traffic is good. I’m extremely humbled and honored that they would come all that way just to play a nine-hole course. It also shows the dedication of the disc golf community here in Korea. That being said, I’d be lying if I said I wasn’t nervous. Until now, the only people who have played the Dragon’s Lair are my fellow soldiers. Most of them are inexperienced disc golfers, and the ones who do have “the love of the game” are just glad to have somewhere to play. Would my course hold up to the scrutiny of other DGers who have played all over the world? James has played every course in South Korea and had a hand in designing or raising funds for at least half of them. Luckily for me, disc golfers tend to be a pretty chill bunch. I’m mostly hoping for honest, open feedback so I can make the course even better. As I said in my last travelogue, while South Korea is small as countries go, it can still be difficult and time-consuming to travel anywhere. This is largely relegated to the Seoul area. Get anywhere near Seoul, and you will find yourself with a serious travel headache, unless you grew up in Asia, mostly because of the sheer density of the population. About 90 percent of South Koreans live in Seoul. That’s not around Seoul, or the greater area of Seoul, that’s in Seoul. Pretty wild, no? Now, being as far north as I am, and seeing as how we are somewhat restricted in our freedom of travel, I quickly deduced that making 3- to 8-hour round trip to play disc golf every weekend wasn’t going to work. I’d end up broke or insane, or perhaps both. So this left me with one logical solution — build my own course! Luckily, my barracks are in a rather nice part of the base known as “Dragon Valley,” and I figured I could pretty easily cram a 9-hole course in with no problem. I began scouting the area while I did morning physical training and, with the aid of Google Earth, came up with a delightfully challenging layout. The next step would be the real kicker — cutting through the red tape and actually getting permission to build the course. This turned out to be a bit more difficult than I thought. My first stop was at Morale, Welfare and Recreation (MWR) for a meeting about getting a few bucks to install baskets and signs, and for them to help me get permission to use the land. Three minutes into our meeting I was duly informed that, thanks to sequestration and severe budget cuts, they wouldn’t be able to supply me with anything. In fact, they were so short-staffed they couldn’t even go with me to meet the higher-ups for permission to use the land. They tried their best to help though, making a few phone calls on my behalf and sending me on the way to meet the people I needed to meet. But, for now, this course was going to be built with my blood, sweat, tears, and, perhaps most importantly, my money. I actually have been to South Korea years ago, when I was in the Marines. I was way down south in a port town named Pohang, for training. I was here for about a month and didn’t get to see much of this part of the country, though I recall it being small. …and all the disc golf courses are in Seoul or even further south. 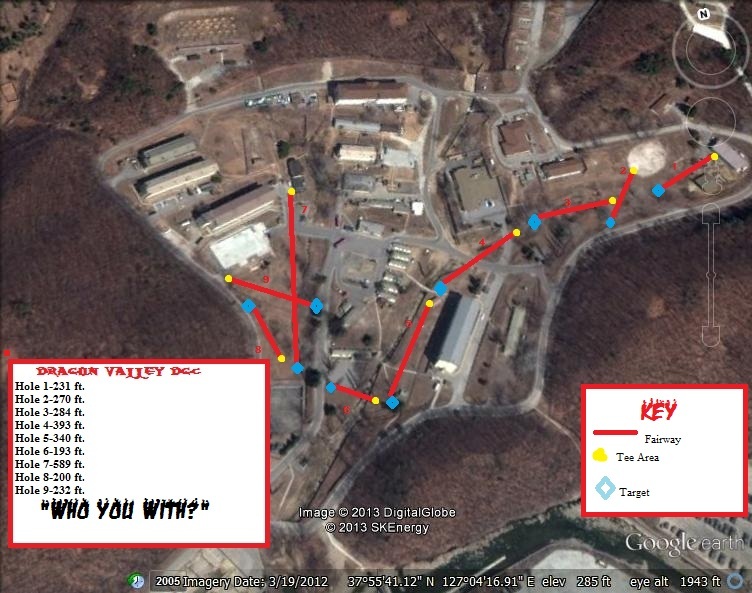 The biggest and best course is DERP (Daegu Environmental Resource Park), whick is about as south as South Korea can get. Not only would I require special permission to go down that far, but it’s also about a five-hour train ride. Even the courses in Seoul require an hour-long train ride, then you have to navigate the Seoul bus system. Since I don’t speak or read Hongul (the native language of Koreans), the buses would be a risky proposition, though the trains do announce all stops in English. Nevertheless, fortune has smiled upon me since arriving. Hello all and welcome to my travelogues, as it relates to disc golf anyhow. I’ve been playing disc golf for almost as long as I can remember. It was taught to me by my dad. When I was very young, he used to take me to the local course in Missoula, Montana, which was simply marked trees in the Rattlesnake Recreational Area. In 1989 or 1990, I started playing by myself using only two discs — a Wham-O ’86 Softie for a putter and a Wham-O Heavyweight catch disc for everything else. By the time I got to high Sshool and had the ability to buy my own equipment, I stocked up with an Archangel, a Tee-bird, a Puma, a couple of Rocs, a Discraft Shadow and three Aeros. After high school, I enlisted in the military and this leads us to the present day. In my line of work, you get used to leaving. I’ve been away for training more times than I can count and have been deployed for nine months to a year four times before. For my fifth deployment, I’m going to Camp Casey in lovely South Korea. Previous deployments have robbed me of playing disc golf, but luckily South Korea is seeing a boom in the sport and actually has more than ten courses in place, most of them 18 holes. This bodes well for me, and as South Korea is still in the infant stage of disc golf, I’m able to use my experience to help truly grow the sport.